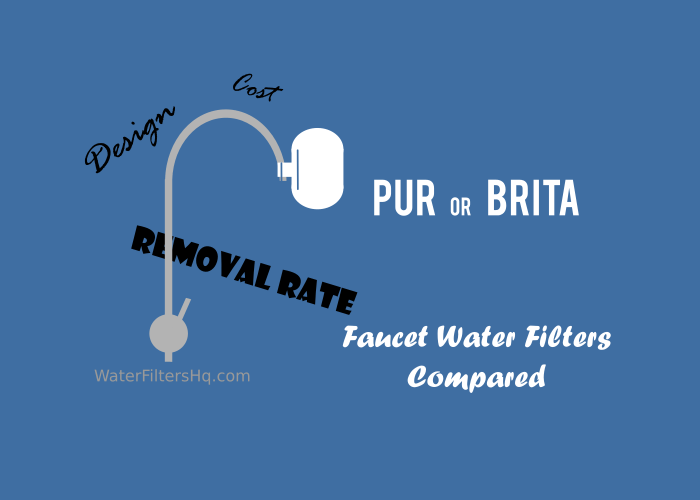 Brita vs. PUR faucet filters - how do they compare? Discover the differences - and similarities - of two popular faucet filter brands with us. We look at contaminant removal rates, design, water taste, cost of ownership and answer questions about the filters. Which faucet water filter is best for you? PUR or Brita? PUR currently sells four faucet filter models and two filters. Both filters fit all models and share the same removal rates. One adds minerals to the filtered water, while the other does not. Of course, the mineral filter costs a bit more to replace. I like it, that they still give you the choice to have an upright mounted filter in one of their models. Brita offers two tap filter models with the same replacement filter. Let' s take a closer look at the filters. Both, Brita and PUR faucet filters, are NSF certified and meet the 42, 53 and 401 standards. And PUR, as well as Brita, published their respective reduction rates. While the PUR cartridges are certified for the removal of 72 contaminants, the Brita filter is for only 60. That could mean Pur is better than Brita. But the devil is in the detail. The removal rates for all three filters are good, compared to other brands. While PUR is a bit better at lead reduction, Brita reduces slightly more VOCs. We have all data in an article about the top faucet water filters. And it is similar to other contaminants. An overview of all reduction rates is here. If i.e. lead is your main concern, the PUR faucet filter would be your winner here. On the other hand, if your water contains VOC's you might prefer the Brita filter. My take here, look what is in your water and compare it to the reduction rate. Then decide for the one that better fits your water profile. PUR and Brita faucet filtration systems are made from some kind of BPA- free plastic. I guess metal would be too expensive and also too heavy. 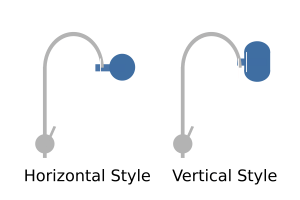 Both Brita faucet systems have upright sitting filters. In the three newer PUR models the filters hang horizontally, while the PUR Classic comes with a vertical filter mount. None of them is meant to swivel out of the way to fill a big pot or do dishes. So it is important to make sure, you have enough space once the filter is attached to your faucet. All PUR and Brita filtration systems have a lever on the side. It' s size is big enough that you don't need great fine motor skills to operate it. So, no difference here. Both brands come with a filter indicator. While the Brita has a single light, Pur uses three lights in a row. That may be helpful for people with a red-green visual impairment. You could tell the filter status by the lights position. Many of you filter water to increase the taste. I do not want to get in the discussion if adding minerals to your water has health benefits or not. That is really not my expertise. Do minerals increase the taste? A lot of people think so. And if you want filtered water with added minerals, you have no alternative. Only Pur has minerals filters for their faucet system. The Brita Complete faucet mount system is the only one with three spray options. The Brita Basic and all Pur systems only have two. So, this point goes to Brita. Let' s take a look at how much you have to spend to use your faucet water filter. Brita and PUR filters are both good for up to 100 gallons. But while PUR recommends a filter change every three months, Brita says, that is OK to use the filter for four months. Now, let' s assume, you use your faucet filter for 100 gallons every three months. You would need the same amount of filter replacements for your PUR or Brita water filter. With the higher list price for Brita replacement filters, moneywise the PUR system would be the better choice. Only if use your filter for less than 100 gallons within the three months, the cost would be nearly the same. When it comes to the yearly cost for filters, the PUR faucet system seems to fair better. Even with the more expensive mineral filters. All faucet water filter systems seem to have a problem with cracking and leaking over time. No matter which brand you choose. It is in the design. A sudden increase in water pressure or moving the filter around puts stress on the material. And soon or later you have a problem. Pur offers a two-year limited warranty, while with Brita you are only covered for one year. During this period you could always ask the manufacturer for a replacement. Both companies have contract with a recycling expert. You can send used filters and systems back to the manufacturer. The process is similar, too. You register, request a free postage coupon, collect them minimum amount and ship it off. The faucet filter systems of both brands share a lot of features. You could decide by cost of ownership, and get a Pur filter system with the basic filter. My tip, choose depending on the contaminant removal rates. Go with the system that tackles the impurities in your water best. For chlorine and VOC removal, Brita seems to be better. For lead and TTHM reduction, PUR would be my first choice.